In the nineteenth and twentieth centuries, many Gloucester-based boatmen went 'up country' in narrow canal boats carrying a great variety of cargoes to and from the Midlands via the River Severn. This page describes a typical trip. For informationa about one of the leading boating families, see Tonks Family. 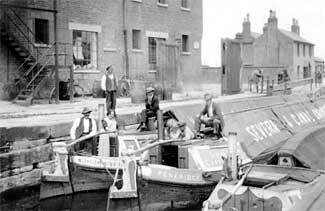 The boats were about 70ft long and 7ft wide to suit the locks of the midland canals, and each had a small cabin at the stern for the crew to live in while on a trip. Some boats were worked by two men, but in many cases the master took his wife and young family as crew or maybe just a teenage son. 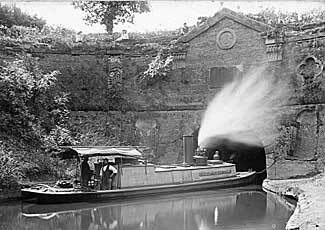 Each boat could carry up to 30 tons of cargo which was usually covered by canvas cloths. Boats leaving Gloucester commonly carried grain, timber or general cargoes, either loaded from the local warehouses and timber yards or trans-shipped from ships or barges in the docks. Early in the morning, loaded boats were man-handled through the lock on to the River Severn where a steam tug was waiting to tow them 'up country'. Some boats loaded hay from riverside meadows, and these joined the tow on the way up the river. There could be half-a-dozen or more boats in one or sometimes two lines behind the tug, and progress could be slow if the boats were loaded heavily or the river current was strong. Usual practice was to steer close to the inside of the river bends to avoid the stronger current around the outside. Most boats left the river at Worcester to join the Worcester & Birmingham Canal, although some continued up to the entrance to the Staffordshire & Worcestershire Canal at Stourport. At Worcester, the crew collected a horse from the stables and set off on the long treck to Birmingham. Generally, one member of the crew had to walk with the horse to encourage it to keep going. If the crew comprised a husband and wife, they were likely to take it in turns to walk and steer, but if a child was on board, he (or she) was expected to do most of the walking! The routine for opening and closing gates and paddles when working through each of the 58 locks on the route was very well established. This routine was particularly important when climbing the famous Tardebigge flight, comprising 30 locks in two miles, and it was greatly helped by having an experienced and good natured horse. At the top of the Tardebigge flight is the long summit level which passes through three tunnels on the way to Birmingham. The boats were towed through the tunnels by tugs, and one member of each crew had to walk the horse over the top of the hill, usually a task for a junior member of the family. The horse towed again for the final stretch into Birmingham, and as this ran close to a noisy railway line, special care was needed to avoid a frightened horse slipping into the canal. Most cargoes were discharged at the numerous canalside wharfs near the centre of Birmingham, but some were taken on further to places like Wolverhampton and Wallsall. Many boats then went to collieries in South Staffordshire or Cannock Chase to load coal, while others picked up iron or manufactured goods or called in at Stoke Prior on the way home to load salt. The return to Gloucester involved passing through the tunnels, working down the locks and getting a tow down the river. While under tow, it was usual for each crew to clean their boat's cabin and polish the brass ready for the next trip. The round trip commonly took 10 to 15 days, and on arrival at Gloucester, the crew returned to their homes until the next time they went 'up country'.